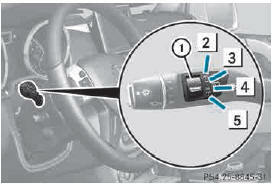 ► Turn the SmartKey to position 1 or 2 in the ignition lock. ► Turn switch : on the combination switch to the corresponding position. When the rear window wiper is switched on, the icon appears in the instrument cluster. The rear window wiper comes on automatically if you shift the selector lever to R while the windshield wipers are on.